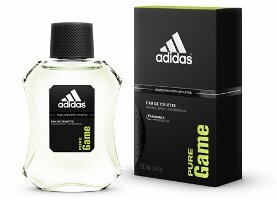 Adidas has launched Pure Game, a new soccer-inspired fragrance for men. Pure Game was originally released earlier this year in a special edition for the South Africa World Cup, and has now been added to the regular Adidas line. Pure Game is a green woody fragrance; the notes include grapefruit, mandarin, basil, lavender, pepper, guaiac wood, cypress, patchouli, Tamboti wood, tonka bean and incense. No grass scent, no leather, no hops (representing the aroma of the favorite beverage in the stands). What game are these folks playing? Oh, basil, lavender, grapefruit and mandarin. These folks are playing homestyle Iron Chef. seriously? no leather? no GRASS?? Maybe they just didn’t mention those two because it’s so obvious, and they didn’t want to insult our intelligence…. darn! and I was already imagining all those buff Brazilians running about in shorts…. so are you going to try to tell me that that is not the best part of watching soccer world cup games??? seriously? ha!